My blog is nine years old today and I’m celebrating with Fresh Lumpia. 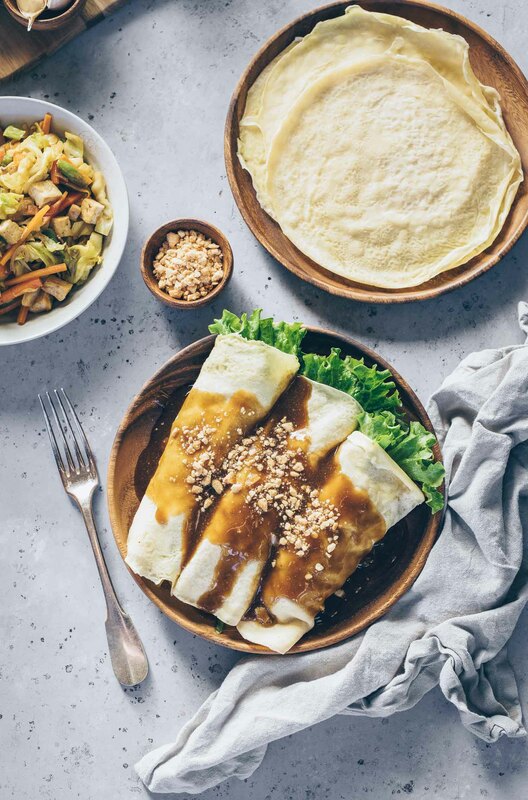 Stir-fried vegetables wrapped in a homemade crepe and topped with a lightly sweet sauce and crushed peanuts. With tips from my mom and my own twists you might not find this recipe anywhere else but it keeps the integrity of the original intact. “Is this like moo shu vegetables?” my husband asked. “Very similar, actually,” I replied, realizing at that moment that he had just made a connection between the two dishes that I hadn’t bothered to make. He’s right. Moo shu dishes are shredded, stir-fried vegetables wrapped in an egg roll wrapper with hoisin sauce served on the side. An egg is usually cooked with the vegetables, though my husband always passes on this, along with the protein it most commonly comes with, pork. 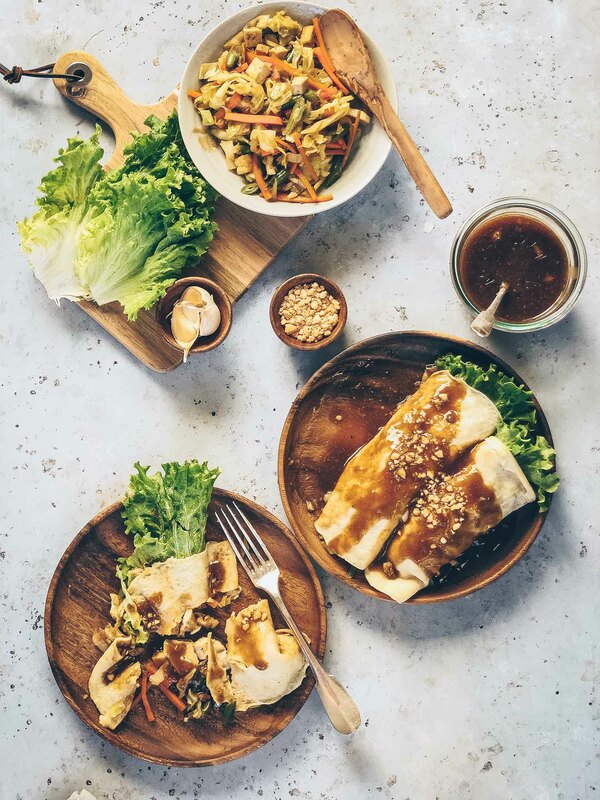 Fresh Lumpia is also made with stir-fried vegetables, mostly cabbage, wrapped in a lumpia wrapper and topped with sauce. 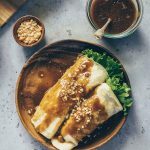 The main proteins for fresh lumpia are pork and shrimp but rather than hoisin sauce, a mildly sweet, boldly flavored sauce, fresh lumpia sauce is mostly sweet with garlic notes. The fresh rolls are garnished with curly lettuce and crushed peanuts are always sprinkled on top. 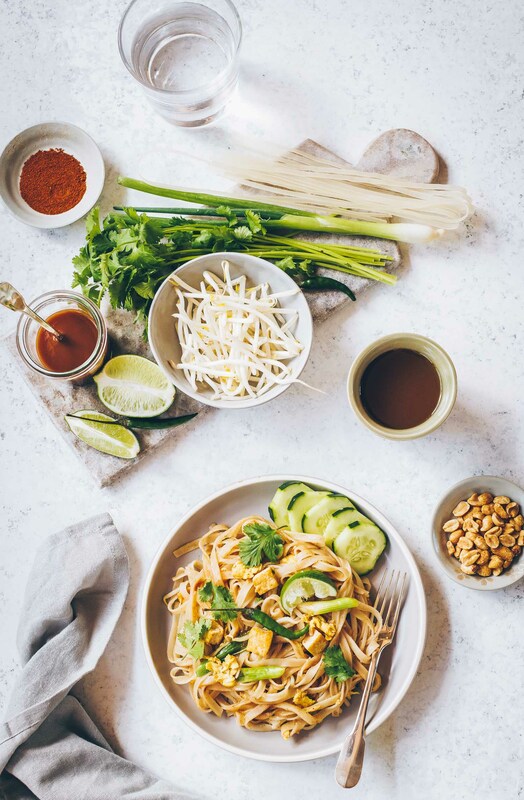 The recipe I’m sharing today uses tofu for protein and if you skip the small amount of fish sauce I used, it’s vegetarian. Most Filipinos who grew up eating fresh lumpia might balk at my omitting the pork and shrimp but they’re not necessary. It’s meant to be mainly a vegetable dish, the meat an extra component. But unless you’re lucky enough to taste a homemade version, what you’ll often get in a restaurant would likely be loaded with meat but it will also be drowned in a thick, sugar-water sauce. And the lumpia wrapper will often be dry, brittle and previously frozen. VEGETABLES. The base vegetables are cabbage, carrots and green beans and from there you can add jicama, sprouts, sweet potatoes (and chickpeas, too). Tip #1: The most common seasonings for fresh lumpia are soy sauce and fish sauce (this can be omitted if vegetarian). I like to add kecap manis. Kecap Manis is an Indonesian sweet soy sauce–dark and thick like molasses with its sweetness coming from palm sugar. For my fresh lumpia, I like to use it in both the stir-fried vegetables and the sauce. It’s both sweet and salty and a little goes a long way. FRESH LUMPIA SAUCE. Sugar, soy sauce, garlic, stock or water, thickened with corn starch. It’s an important component of the dish with room to make most recipes better. Tip #2: I build flavor four ways, the first two my mom swears by when she makes her fresh lumpia. Save the Vegetable Drippings. To prevent a soggy fresh lumpia the stir-fried vegetables are drained of the liquid that accumulates while cooking. My mom always saves the drippings and adds them to the sauce for extra flavor. Peanut Butter. 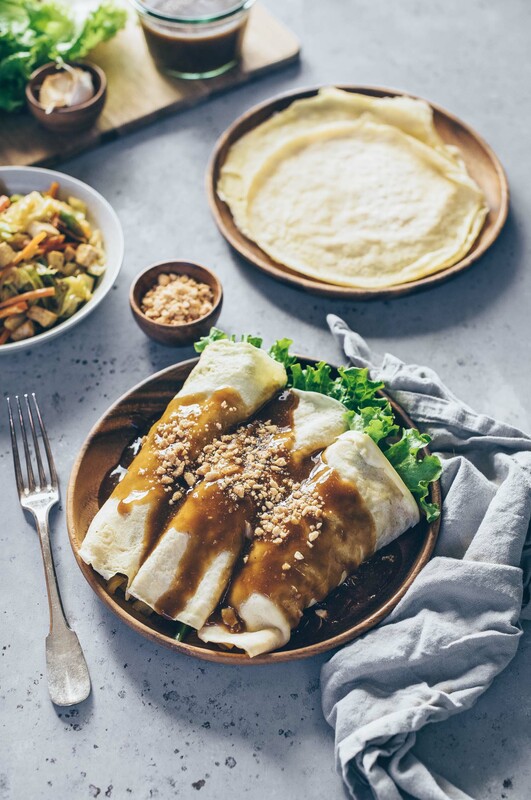 I’ve not seen another fresh lumpia recipe that uses peanut butter in the sauce and it works. A little goes a long way to add substance without the finished product tasting like satay sauce. 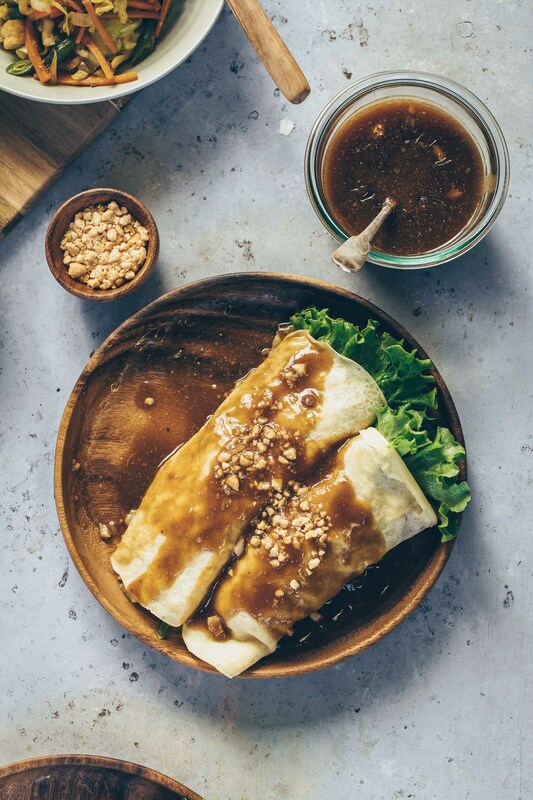 Fresh lumpia is always served with a topping of ground peanuts so a little help from peanut butter in the sauce makes a lot of sense. Porcini Mushroom Broth. Rehydrated dried porcini mushrooms add flavor to the vegetables and the stock is perfect for adding umami to the sauce. This is an optional addition and any dried mushroom will work in this recipe. Vegetable Broth. If you’re not a vegetarian, feel free to use your favorite chicken stock. For this recipe, I’m happy to share that I have finally found a store-bought vegetable stock that I like: Ocean’s Halo Veggie Broth. It’s seaweed-based and doesn’t have that sweet and flat quality that I find most vegetarian broths have. FRESH LUMPIA WRAPPER: It’s perfectly acceptable to use store-bought lumpia wrappers but in my opinion they are best saved for the fried variety. Homemade wrappers are made with a very simple crepe batter–the recipe I’m sharing is very basic with only water as the liquid, it’s all you need but feel free to use milk if you’re feeling fancy. 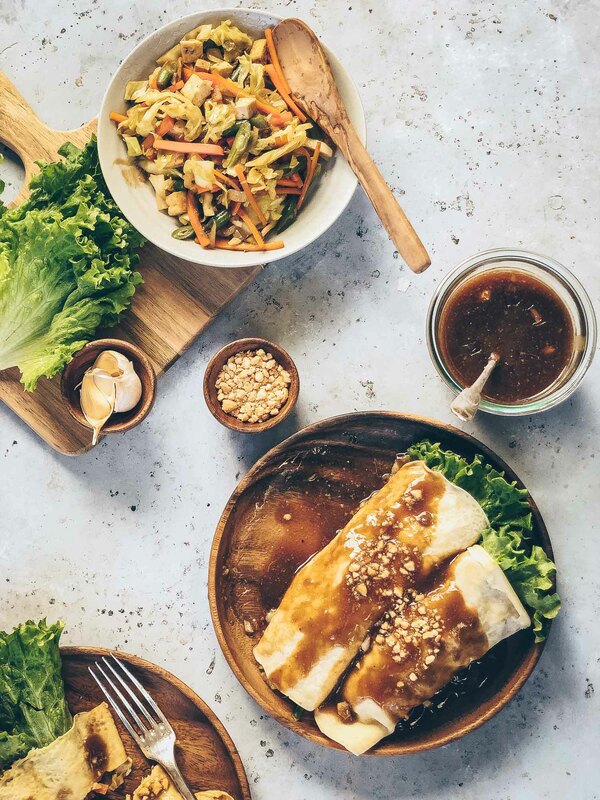 Once the three components are done–filling, sauce and wrapper–the assembly is quick and you can enjoy a flavorful, healthy homemade fresh lumpia. I couldn’t think of a better recipe to celebrate nine years of blogging. Fresh lumpia is an homage to my Filipino roots and one that I plan to feature more in the future. 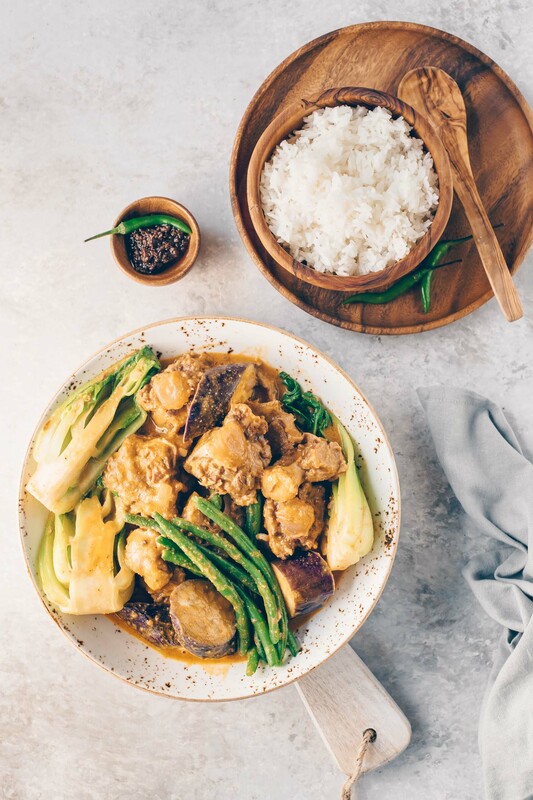 It’s a common misconception that Philippine cuisine tends to be ugly and loaded in fat; this recipe shows that it can be healthy and beautiful, too. 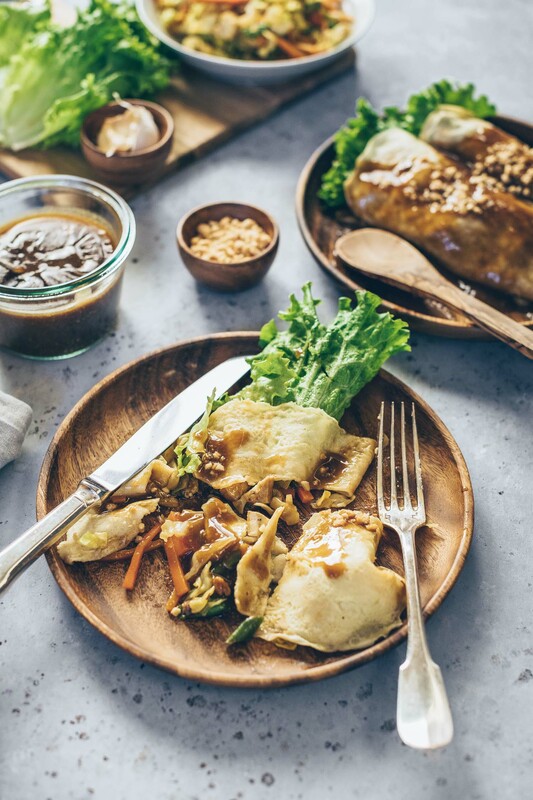 My vegetarian fresh lumpia recipe includes a few simple tips for optimizing the flavor of the final dish without a cloyingly sweet sauce. 10 ounces tofu, drained and cut in cubes. I like Hodo Soy brand. Whisk together the water, flour, egg, pinch salt and one tablespoon vegetable oil. You can use it right away but for best results, let rest in the refrigerator for at least one hour or when you’re ready to assemble the lumpia. Cook the tofu in one tablespoon of oil in a pan over medium heat (season with a pinch of salt) until most sides are slightly golden. Set aside. A nonstick skillet or cast iron skillet would be better for this to prevent sticking. In a large pot, heat two to three tablespoons of oil over medium heat. Add the shallots, onion powder, diced porcini mushrooms and cook for one minute, seasoning with a pinch of salt and pepper. Add the garlic, soy sauce and fish sauce and cook for thirty seconds before adding the carrots and green beans. Sauté for three minutes then add the cabbage, tofu cubes, 1/4 cup of the mushroom liquid, 1/4 cup veggie broth and two teaspoons kecap manis. Stir to combine. Cover, reduce the heat to simmer and let the vegetables cook for about three minutes. After this time, check for additional seasonings according to your taste. The vegetables should be cooked but still have some firmness. Place a bowl under a colander and transfer the veggies to cool and drain. The vegetables should be allowed to drain for at least thirty minutes so you can stop here, refrigerate the vegetables while they drain and finish the recipe later. 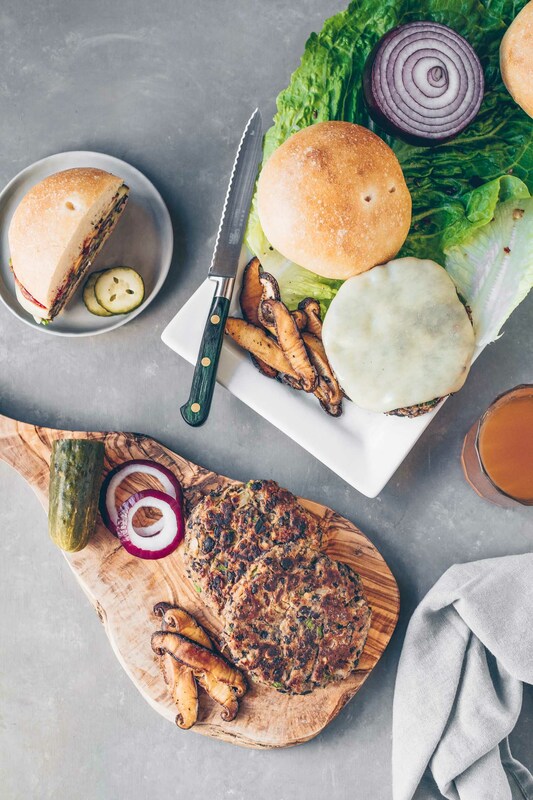 In a small stock pot combine the two cups liquid–veggie drippings (won’t be more than 1/8-1/4 cup), remaining 3/4 cup mushroom soaking liquid and enough veggie broth to make two cups. Add the brown sugar, soy sauce, recap manis and garlic. Slowly bring to a boil then reduce the heat to medium. Cook for about three minutes to take the bite of the garlic out and infuse the sauce with flavor. Take a few tablespoons of the hot liquid and combine with the peanut butter. In another small bowl, take another 1/4 cup of the hot liquid and whisk in the corn starch until dissolved. Add the peanut butter mixture back, stir until it’s been fully incorporated and smooth. Add the corn starch mixture and bring back to a boil. Cook for another two to three minutes until the sauce has thickened. For this I used a small nonstick frying pan, yielding six-inch wrappers. You can make larger wrappers for larger lumpias. Heat the pan over medium heat. Brush a little oil in the pan and scoop a 1/4 cup amount of batter into the pan. Swirl the pan around to cover the surface. The edges will pull from the sides of the pan indicating that the crepe is ready to flip. This will take about two minutes. Flip and cook the other side for another minute or two. The wrappers will not be brown and you don’t want them crisp either so watch them carefully. Take a lettuce leaf (remove the hard white parts) and lay on top of one lumpia wrapper, leaving a small portion of the lettuce above the top edge of the wrapper. Add some of the vegetable/tofu filling and fold each side on top and flip over to keep the seam side down. Drizzle with the sauce and top with crushed peanuts. Vegetarian Broth: I like Ocean’s Halo Veggie Broth. If you want to use a non-vegetarian broth, I like Swanson’s Low-Sodium Chicken Broth. Lumpia Sauce: as mentioned above, you can just use chicken broth or the vegetable broth for the entire two cups of liquid. The use of mushroom liquid is optional. 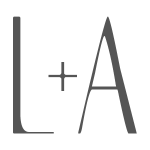 Congratulations on your blog’s anniversary, nine years, that is terrific. What a pretty and different recipe you have chosen to celebrate the occasion.